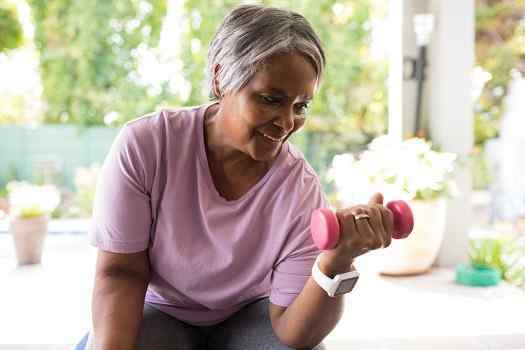 Having good muscular strength is important at any age, and it’s particularly useful for seniors. Older people who have good muscle tone tend to have fewer accidents and mobility issues. However, it can be a little challenging to remain strong because humans naturally lose muscle mass as they age. If your senior loved one wants to remain strong, make sure he or she follows these tips. When the body doesn’t get enough protein to carry out certain important functions, it takes the necessary protein directly from the muscles. To prevent this from happening, seniors need to get at least 0.8 grams of protein per kilogram of bodyweight, which works out to about 55 to 80 grams for the typical senior. If your loved one plans on exercising and trying to build muscle, he or she needs even more protein. Consuming large amounts of protein is sometimes difficult for seniors because they’re not hungry as often and may not be able to chew up tough foods that contain protein. A good solution to this issue is drinking a protein-rich shake each day. Weightlifting exercises are a key part of maintaining strength in the senior years. Regularly using the muscles for exercise sends signals to the body that the tissue is being used, and muscle mass decreases at a slower rate. However, the golden years probably aren’t the best time to start trying to lift hundreds of pounds like a professional bodybuilder. To prevent injuries, doctors recommend seniors start out with smaller weights and pick a program with a very gradual weight increase. If your loved one needs help adopting healthy routines that build muscle strength, consider enlisting the help of a professional caregiver. When considering at-home care, Green Valley, AZ, families should make sure their senior loved ones have the resources they need to maintain their independence and remain healthy. Trusted in-home care professionals can assist seniors with daily tasks like cooking, bathing, and exercise, and they can also encourage them to focus on healthier lifestyle habits. Trying to do things they could easily do in their twenties can lead to a lot of frustration and potential injuries for seniors. Though it can be challenging, seniors need to have the self-confidence to recognize their limitations and seek ways to manage them. For example, your loved one can try sitting in a chair while doing bicep curls or switching to an elliptical exercise machine that’s easier on the joints. Look for methods that let your loved one work out muscles while accommodating balance, flexibility, and endurance issues. Some aging adults need help to get the exercise they need, and the amount of assistance required can vary, from occasional to around the clock. If your senior loved one needs hourly or live-in care, Green Valley Home Care Assistance can help. Our caregivers can assist with exercise and mobility, prepare nutritious meals, provide timely medication reminders, and help with a wide array of other important daily tasks. Eating plenty of protein isn’t enough to help seniors maintain their strength. An important aspect of strength is overall caloric intake. If your loved one regularly eats fewer calories than he or she burns, his or her body will begin to use fat and muscles for energy. Over time, this could end up making your loved one feel quite frail. Track your loved one’s caloric intake and make sure it meets the recommended total daily consumption for his or her age, height, and weight. Some aging adults may need help choosing healthy foods and getting the exercise they need to stay strong in the golden years. In Green Valley, elderly home care agencies can be a great boon to seniors. With the help of the caregivers at Home Care Assistance, your aging loved one can lead a happier and healthier life. We offer a revolutionary program called the Balanced Care Method, which encourages seniors to eat nutritious foods, exercise and socialize regularly, and focus on other lifestyle factors that increase life expectancy. Home Care Assistance will work with you to customize a care plan that’s just right for your loved one’s needs. Call us today at 520-625-2050 to discuss how we can give you the peace of mind that comes from knowing your loved one is being cared for with professionalism and compassion.